BURNING WITCHES - HEXENHAMMER LTD. EDIT. (DIGI+2BONUS-TRACKS) | Online Shop | Wizard LTD. Album: "HEXENHAMMER LTD. EDIT. (DIGI+2BONUS-TRACKS)"
- WATCH OUT: THE WITCHES WILL TURN THE TABLES! "Powerful riffs, shredding solos, relentless drums and the fiercest frontwoman out there. It would be misguiding to label Burning Witches&apos; second album according to the gender of the musicians. Hexenhammer is simply one of the best old school heavy metal albums of 2018 in the round." Laziness or downtime are words nobody involved in BURNING WITCHES knows, not even considering all the conscious tradition invoked through their music. And so, the next witching masterpiece is already brewing in the steel cauldron. The book MALLEUS MALEFICARUM (a.k.a. THE HAMMER OF THE WITCHES, in German: “Hexenhammer”) that legitimated the witch hunting in 1486 is the lyrics&apos; center. It is about oppression, violence against the week and manipulation of fact - any of these topics more up-to-date than ever. 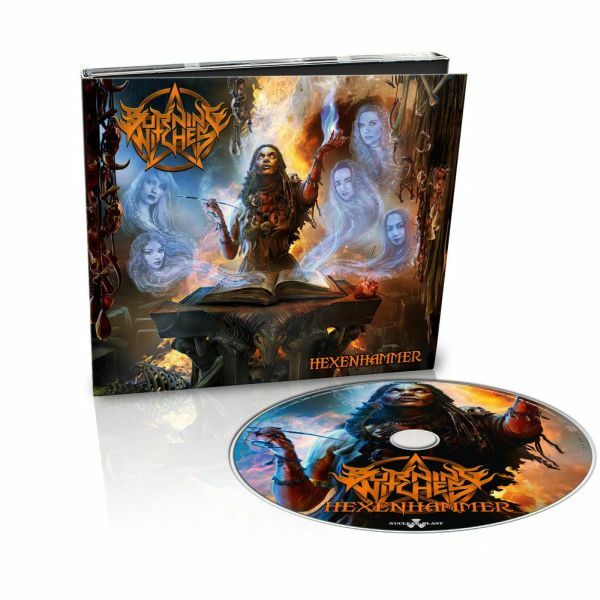 The new album »Hexenhammer« was again produced by the same team as its precursor »Burning Witches« in the Little Creek Studio: V.O. Pulver (PRO PAIN, DESTRUCTION, NERVOSA, PÄNZER) and DESTRUCTION&apos;s legend Schmier, who joined the process as close friend and supporter of the band with some good advice. A present for all true fans who are numerous for the short time the witches circle BURNING WITCHES exists… and they&apos;ve already made sure that some legendary moments happened – for example at the Bang Your Head Winter Festival. Lyrically, you should have a close listen as well, because the witches take care about lots of different topics like true stories, feelings or forged creatures – a clear statement is always given.